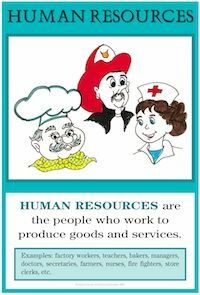 Human resources describe the human work effort, both physical and mental, used in the production of goods and services. Human resources are one of the three basic productive resources: natural, human, and capital. Human resources, like the other productive resources, are considered scarce. That is, human resources are not freely available in unlimited quantities. This is why producers must pay wages and salaries to obtain the human resources they need to produce goods and services. Not all human resources are equally valuable to producers. Some workers are not highly skilled (i.e. are less scarce) compared to others, and do not earn as high a wage. Very skilled and educated workers are typically very productive, and, therefore, are highly valued by employers. These workers usually command a high wage/salary. Examples would be a star athlete or brain surgeon. Workers who possess significant skills due to education and training are said to have high levels of human capital. It takes discipline and hard work to develop human capital. To do so often means investing one's time and savings in education and training courses. But the result is a reasonable expectation of higher income and usually a more interesting job. Cut pictures out of magazines of people at work. Identify the education and skills required for the jobs. Create a bulletin board or scrapbook entitled, "People in Our Community Work To Produce Goods and Services." Use photos of people working in the school or community. Interview people to find out the education and skills required for the jobs. Working in groups, examine the Help Wanted ads in a newspaper. Analyze whether wages and salaries vary according to education and skills. Interview parents about the goods or services produced at their jobs. List the human capital requirements needed in the job. Invite community workers to class to explain their jobs. Have students prepare interview questions beforehand. Write paragraphs about what was learned in each visit. Write a paragraph entitled, "What Good or Service I Want To Produce When I Grow Up." Draw a picture to accompany the paragraph. Prepare a student resume, listing education, skills, and abilities.